This past April, Gettysburg, PA, hosted the Darcy Babcock and TJ Kerr wedding - it was a cool, brisk but sunny spring day. 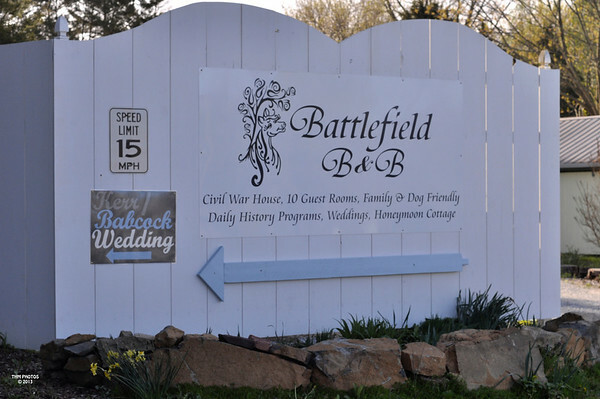 The wedding took place at the Battlefield Bed & Breakfast on land used by Union cavalry on July 3, 1863. The reception was held in a barn built in the early 1800's. After the ceremony, Darcy and TJ drove to Little Round Top, a rugged hill located in southern section of the National Park. Startled visitors to the Park broke into applause when TJ explained this is where he had proposed to Darcy.